Is there anything else I need to know to correctly use and store this tape? This tape should be stored in its original packaging in a cool, dry area away from direct sunlight, and should be used within 12 months of the shipment date. Before applying the tape, the surface to which it's being applied should be clean, dry, and free of grease, oil, and other contaminants. 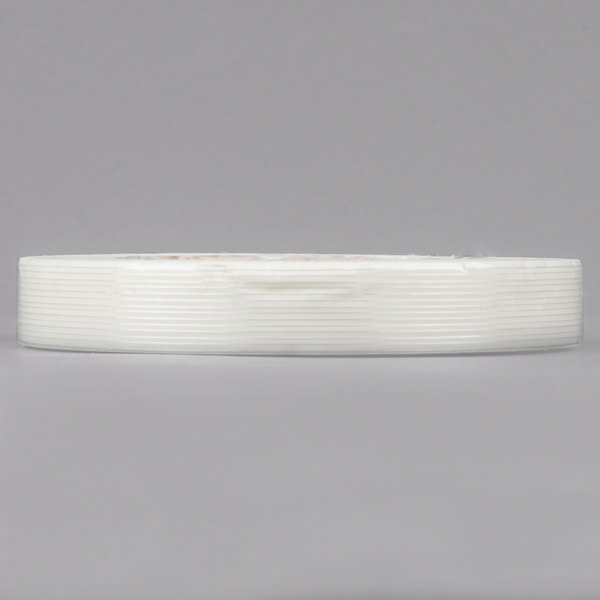 Use this general purpose fiberglass reinforced strapping tape to package, bundle, and palletize large orders with ease! 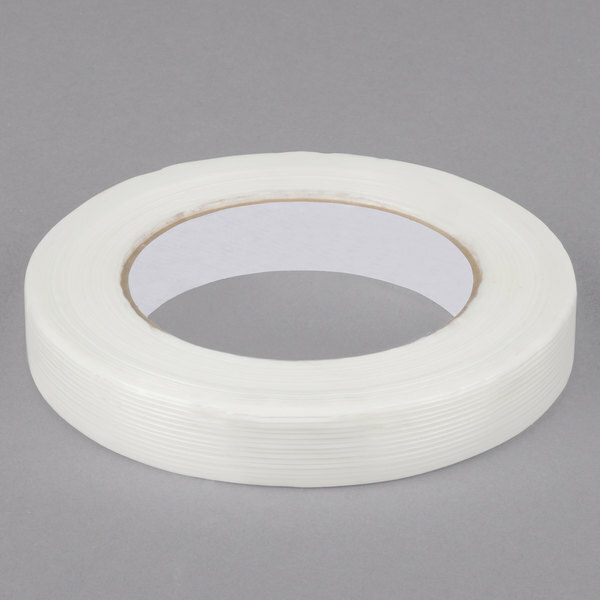 Made from biaxial oriented polypropylene, this fiberglass reinforced strapping tape offers exceptional strength while ensuring an easy, efficient application every time. It features a synthetic rubber, hot melt adhesive that provides a quick, strong stick, making it ideal for a variety of shipping purposes. With its 4.5 mil thickness and 100 lb. 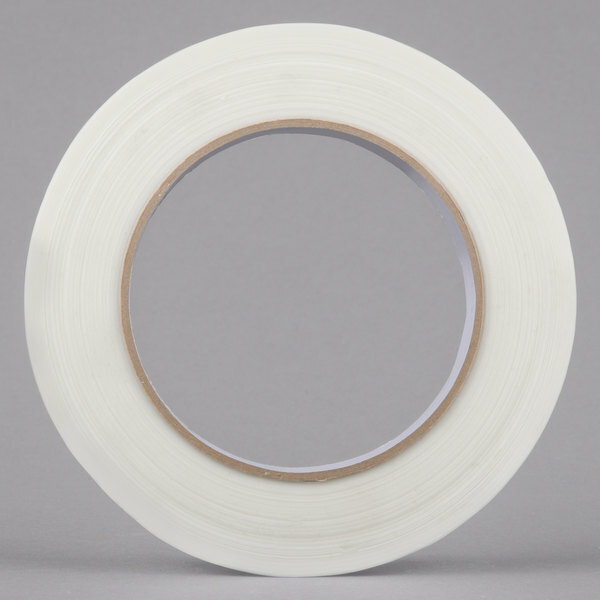 per inch width tensile strength, this tape prevents splitting and cracking to provide superior reliability. Its also resistant to shock, moisture, and solvents to further ensure a strong hold, offering the long-lasting performance your business needs and expects. 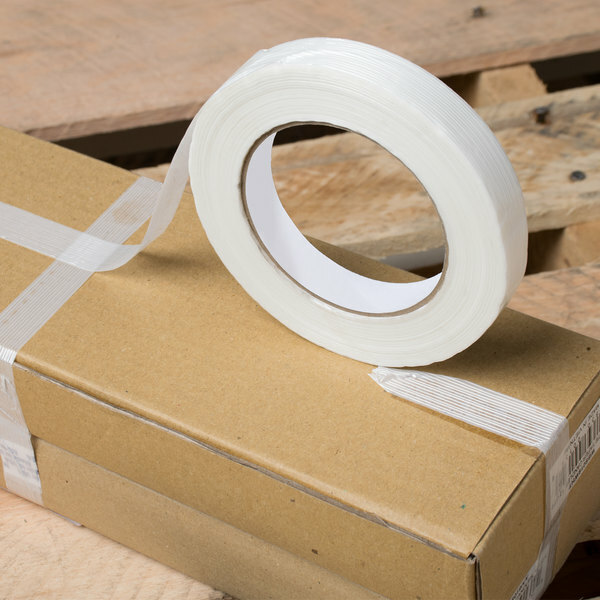 A great addition to any warehouse or shipping department, this general purpose tape is the perfect solution for all of your strapping and packaging needs. I use these to strap two identical size boxes together to save on shipping. I then use regular tape to go over the joint for extra strength. This strapping tape is very heavy duty. It is made of durable cast polypropylene and is moisture resistant. This tape can be used for packaging. We typically use this tape to secure large boxes we are shipping from the kitchen. Very low price compared to the local hardware store. 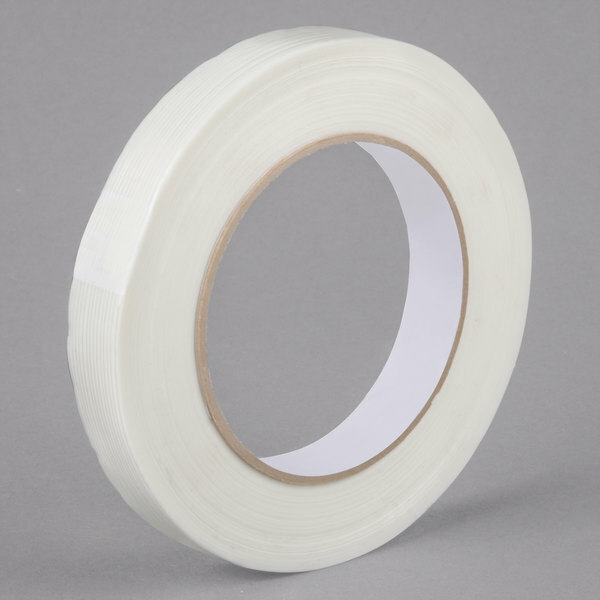 This white strapping tape is ideal for taping up packages for shipping. It has small threads that run through the tape which reinforce the seal. This type of tape is super useful for reinforcing cardboard boxes! It appears to be really great quality from what I've seen so far. Good price, too. The three quarter inch sixty yard roll of Strapping Tape has been very helpful because of its durability. The tape is strong but not as tacky as duct tape and has a clean release when needed. The pale color is easy to write on with any marker and I would recommend. Tape has many uses, and you can find it almost anywhere, but you will not find a better price than webstaurant. This is awesome for holding together orders of multiple boxes. Awesome little packaging tape. We were hesitant at first, as we package a ton for our business. Generally, we use various tapes, but after briefly using this one we may have found a winner. Not to mention, it is slightly cheaper! Using the Strapping Tape 3/4" x 60 Yards (18mm x 55m) around our yellow envelopes to make sure the books is secure on all four sides and won't fall out during shipping. We work hard for our inventory and don’t want it to get lost in the mail. This stuff is really great for any type of serious packaging. Great tape and very sturdy. This stuff will not break. Great product and good price.